The entrance to this lovely farmhouse is through a formal living space, leading to a rustic sitting / dining area overlooking the pool terrace outside. The fully equipped kitchen connects to the pool terrace. 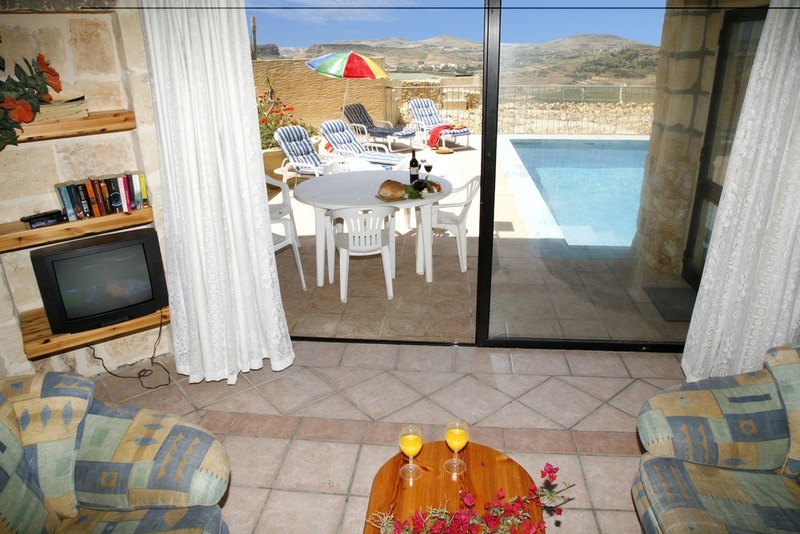 The private pool terrace outside enjoys wonderful views of the countryside and the citadel in Victoria. It is complete with garden furniture, sun-loungers, umbrella and a BBQ (operates with gas - provided). The utility room and the spare toilet are located next to a beautiful staircase leading to the 3 delightful bedrooms up stairs, all having their own en-suite shower bathrooms. The master bedroom and one of the single bedrooms enjoy a cosy, private balcony overlooking the pool terrace below and the countryside views beyond.